Review by AllTheBestFights.com: 2018-02-24, fight not particularly exciting between Anthony Yarde and Tony Averlant: it gets two stars. The undefeated Anthony Yarde entered this fight with a perfect record of 14-0-0 (13 KOs=93%) and he is ranked as the No.14 light heavyweight in the world. He fought five times last year beating Richard Baranyi, Norbert Nemesapati and Nikola Sjekloca in his last three. His opponent, Tony Averlant, has a boxing record of 26-9-2 (5 knockouts) and he entered as the No.50 in the same weight class. He lost to Dominic Boesel in 2016 but then he has won over Mikheil Khutsishvili and Tommy Spahija. 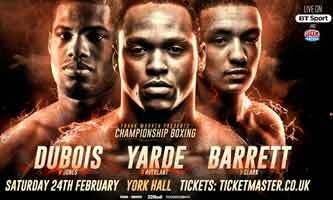 Yarde vs Averlant is valid for the WBO European and WBO Inter-Continental light heavyweight titles. Watch the video and rate this fight!